In 2007 Drs. Brian Luckman and Menounos stumbled upon an important series of moraines at the terminus of Castle Creek Glacier, BC (Figure 1). I was due to start field work on the glacier in a few weeks and one of my PhD supervisors, Brian Menounos, asked me to determine if the series of ridges were annual push moraines. Figure 1: A view towards the terminus of Castle Creek Glacier, taken in September 2008. 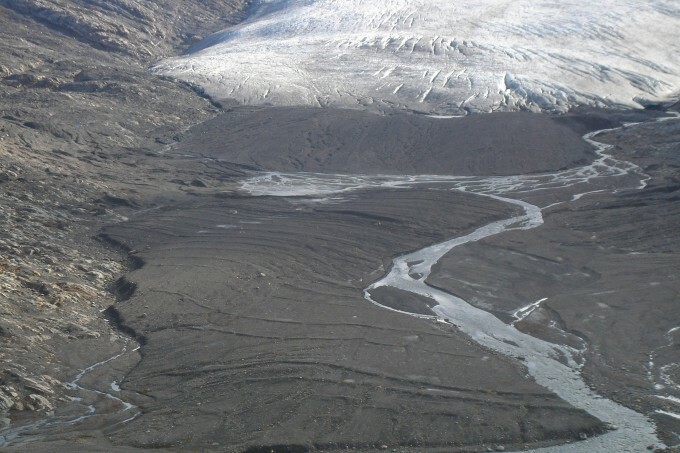 The series of roughly parallel ridges of sediment to the left of the stream are a portion of the annual push moraines that have been formed as the glacier recedes. Annual push moraines form in winter when a glacier advances a meter or more, bulldozing sediment and rock into a small ridge. If summer retreat of the glacier outpaces these minor winter advances, then a long series of push moraines may form. The distance between these moraines varies much like the pattern found in tree-rings; warm, dry conditions tend to increase the separation between the moraines and vice versa. Figure 2: Castle Creek Glacier just begins to pull away from this small push moraine in August of 2007. 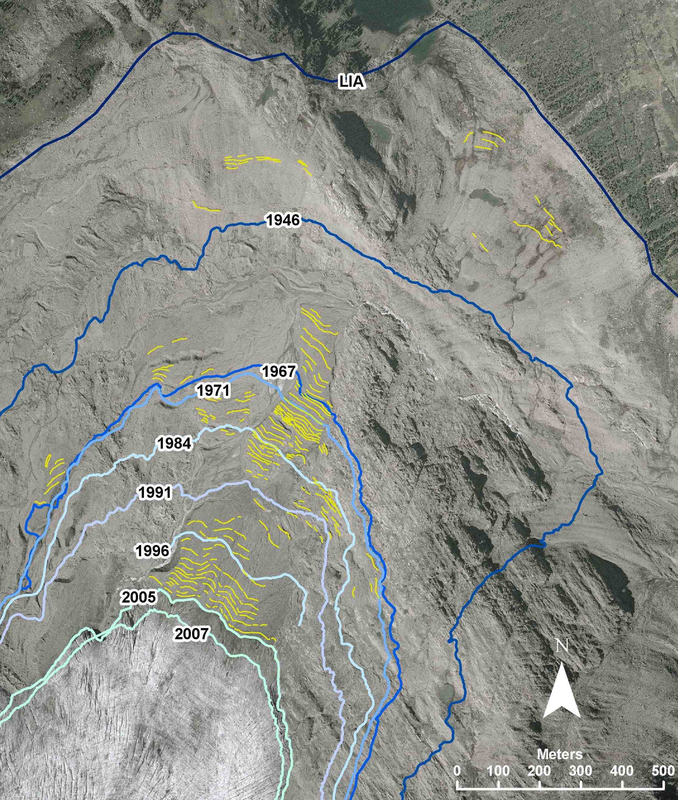 Using aerial photos to date the sequence of moraines, we determined annual retreat from 1959 to 2007 (Figure 3). Castle Creek Glacier retreated about 700 meters during this period, averaging about 14 meters per year (Figure 4). Recession reached a minimum of 3 meters per year in the late 1970s, and a maximum of over 40 meters per year in the early 1990s. These changes coincide with temperature variability recorded during the period 1959-2007. Figure 3: An image from 2005 showing glacier positions mapped from aerial photographs (blue lines) and push moraines (yellow lines). The blue line labeled ‘LIA’ is the position of the Little Ice Age maximum extent, a position that glaciers in western Canada were at in about 1850. Although glacier retreat is dominantly controlled by summer temperatures, winter precipitation also plays a role. Our work shows a delay of about a decade between winter precipitation (snowfall) and the response of the glacier terminus – this delay or reaction time varies for a given glacier and depends on physical aspects of the glacier such as its length, thickness, volume, or steepness. Annual retreat of Castle Creek Glacier is similar to observed recession for other glaciers in British Columbia, Alberta, Washington, and Alaska. A common climatic factor is the most likely explanation for synchronous behavior, and it appears that air temperature is that common factor. 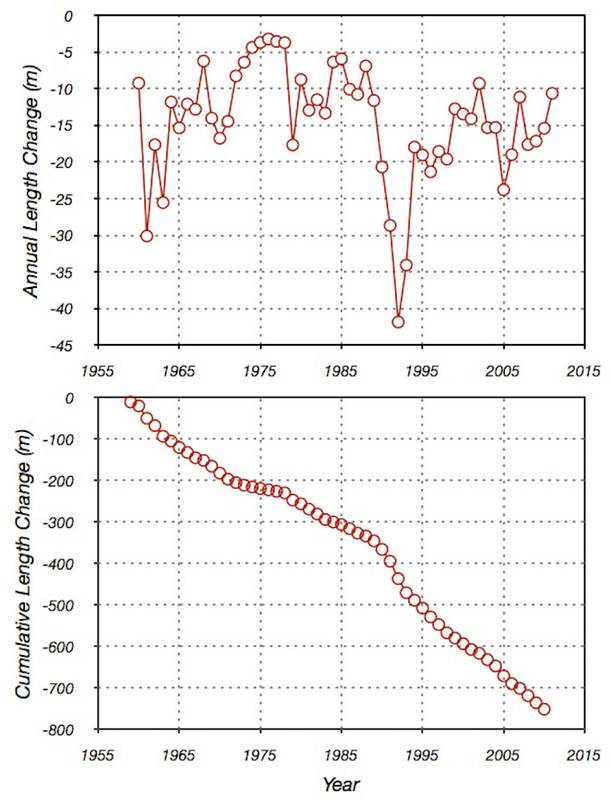 Figure 4: Plots showing Castle Creek Glacier annual retreat (top) and cumulative retreat (bottom) updated through 2010. Measurement of annual push moraines from high-resolution imagery provides an inexpensive method to record the magnitude of future glacier retreat (field surveys of glaciers are expensive and time consuming). 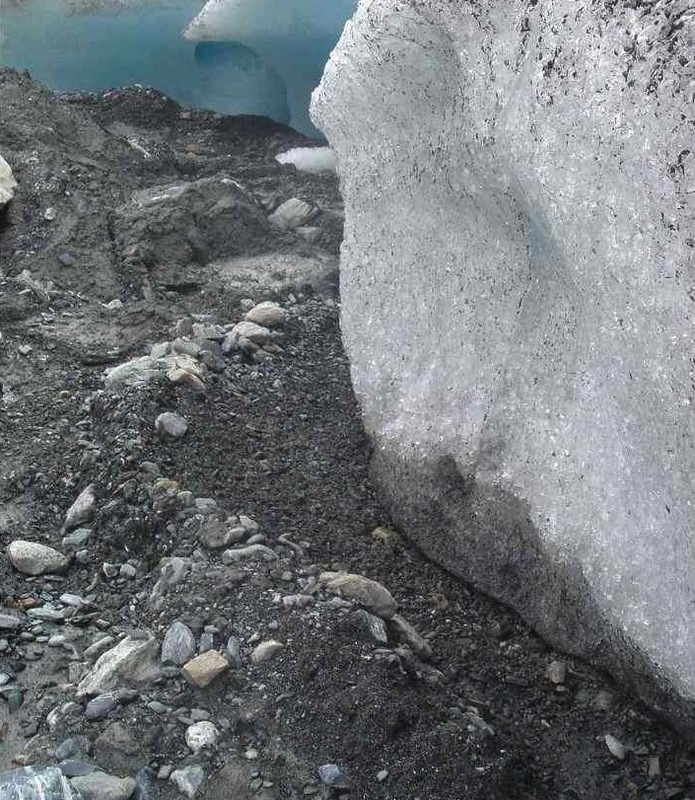 Though such records are rare, they provide invaluable records of glacier change. We have identified other series of push moraines that front glaciers in North America using aerial photography and other high-resolution imagery available on GoogleEarth, and we encourage others to exploit this important proxy of glacier change. Since 2007, Castle Creek Glacier has continued to retreat and to form annual push moraines. We have updated our analysis through 2011 and will update our measurements in 2012 to extend the longest record of annual glacier retreat in North America. Figure 5: Castle Creek Glacier at dusk. September 2010.